What’s openSPOT good for? Let’s say you live in Budapest, and talk to your friends on the local DMR repeater HG5RUC, which is on reflector 4770 on the Brandmeister network. If you travel around the world, where you can’t reach the repeater HG5RUC directly, you can still talk with your friends by using an openSPOT and a DMR (or C4FM) radio by connecting it to the same reflector which HG5RUC uses (4770, BM). If you speak on your DMR/C4FM radio on openSPOT’s frequency, it will route your call to reflector 4770, and HG5RUC will transmit your signals all around Budapest, so your friends will be able to hear and talk to you. If you don’t have local repeater coverage, openSPOT can link you to DMR, D-STAR and C4FM/System Fusion networks all around the world. If you do have local repeater coverage, you can still make use of an openSPOT to avoid interrupting local repeater traffic. You can reach any reflector or talkgroup with it, so you don’t have to disconnect the local repeater and disturb other local users. Two openSPOTs can be linked together directly without any servers or network infrastructure. Interconnecting two DMR/D-STAR/C4FM sites can be easily done this way. 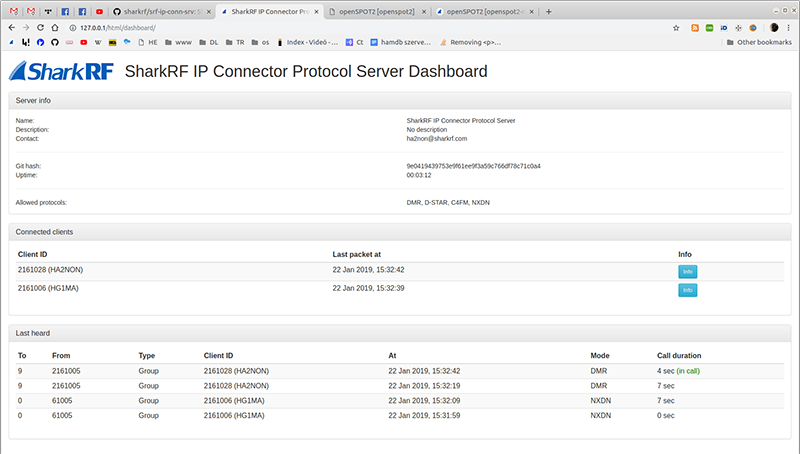 You can create your own private radio network by using our open source server application called SharkRF IP Connector Protocol Server. Multiple openSPOTs can connect to this server, it handles all radio modes, even supports DMR<->C4FM cross mode operation. It also has a nice dashboard. By using openSPOT’s API, you can develop your own software to communicate on DMR, D-STAR and C4FM/System Fusion networks. You can send and receive text messages on DMR networks, or you can create your own RF protocols. All modem settings are customizable. See openSPOT’s product page or user manual for more information.